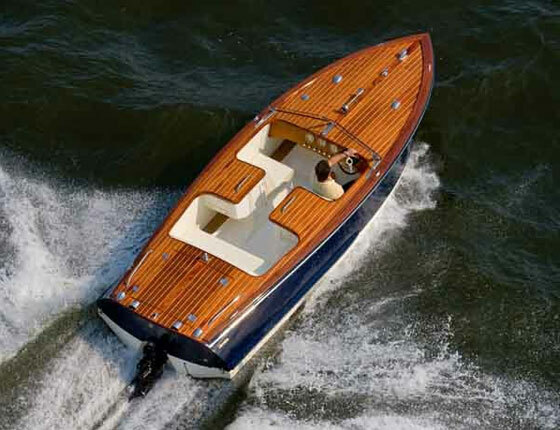 "Peggy B" is the last Cherubini 50 to be built. She was custom built for the current owners with now expense spared and has been constantly updated with the latest being a state of the art electronics package. She is being sold complete and ready to go cruising. Peggy B has been thoughtfully equipped with the use of only the best of equipment through out her construction and final outfitting. Her layout has a great use of space and will provide the new owner with an extremely comfortable cruising yacht as well as a boat that will entertain large groups of friends and guest alike. All interior wood work and cabinetry is made of teak and teak laminates. The upper deck contains a full galley complete with grill, refrigerator and sink and built in seating for 8. For those that want to be out of the sun there is a full one-piece fiberglass hardtop that covers the flybridge, with high one piece double railing that encloses this entire space for safety. 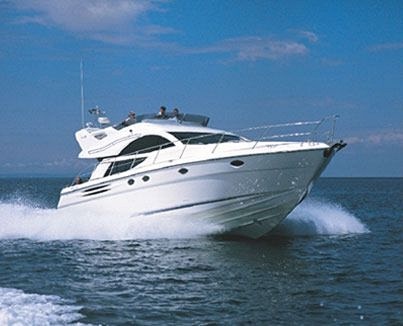 "A must see Yacht in the 50' range"
Now entering through a pair of sliding glass paneled doors you find yourself in a large comfortable salon. 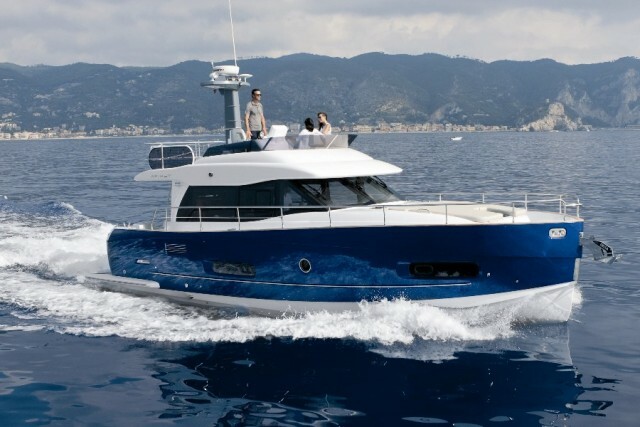 With the design of the Yacht being a full hull with cabin you immediately feel her 14'-6" beam. The use of 4 large opening windows as well as the sliding doors also helps to add to the bright area feeling. On port is a large L shaped settee/table area accompanied by a 12 bottle wine cooler with an ice maker mounted below. On the starboard side you will find a 6'-6" sofa with an entertainment center at the aft end containing a 22" Panasonic flat panel TV, DVD & VHS player as well as a stereo just for the salon and galley area. Moving forward you enter the galley area. This is an up galley styled boat which will not remove you from the guests when preparing a meal or entertaining. This is a large U-shaped galley which is open to the salon. The counter tops are beautifully made of black star fire granite. The cooking chores will be handled by a (4) burner full size propane stove and oven as well as a stainless steel Microwave. For the cool side of things there is a full size upright refrigerator/ freezer as well as plenty of storage for dry goods as well as dishes and kitchen essentials. On the starboard side you will find a full size washer and a dryer hidden by a pair of teak louvered doors. From this point you can continue up a few steps to the wheel house or proceed down a few steps to the staterooms and heads. You will notice the great size of the master which utilizes the full with of the beam and has a private head incorporated into this area. To the port side is a queen size island berth with storage below and flanked by night tables on both sides which also contains storage in the bases. For hanging there are (2) large hanging lockers with a (4) draw dresser between. For night viewing there is a 22" Panasonic flat panel TV and an Alpine stereo. On the Starboard side is the owners head. This space contains a large corian counter topped vanity with sink, full size whirlpool tub, a Vacuflush head and is closes off from the stateroom with a pocket door. Moving forward from the owner’s stateroom you pass thru a pocket door and enter a short hallway with a curved stairway immediately to your right that leads to the wheelhouse. Just forward of the stairs is the conveniently located guest head which is easily accessible to the guests as well as the wheel house and moving forward you enter the guest cabin. The guest head contains a large stall shower with seat, a vanity with a corian counter top for easy maintance and a Vacuflush head. This area is very bright due to the use of light colored materials. The guest cabin contains a large V-berth with a custom inner spring mattress and drawer storage below. The port side contains a hanging locker and dresser. Ascending the curved stairs you now enter the wheelhouse. This area is spacious and airy. You will immediately note the full width control console containing all state of the art navigation instrumentation, engine controls and instruments, tank monitors, radios as well as electric panels for both A/C and D/C power. Behind the helmsman is a full width raised settee that pulls out to make a pilot berth during those long voyages. Leaving the wheelhouse through the side doors allows you to go forward to the bow which has seating for 6 on a full width seat and plenty of protection with 3' high bulwarks topped off with a one piece railing. From here you have full access to the windlass and your two self deploying anchors. If you choose to go aft you will then ascend a set of steps and will be on the fly bridge. This space is a complete entertaining and nav area of its own. 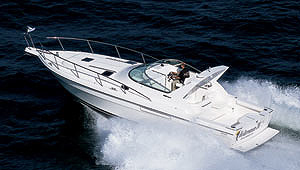 You have a custom made fiberglass bimini supported by matching rails and support structure. 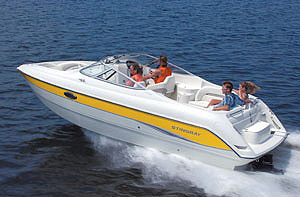 The helm contains redundant instrumentation and engine controls as well as 2 Stidd seats. For entertaining there is built-in seating for 8 with plenty of room for removable seating as well. There is a galley complete with a 2 burner grill, refrigerator, sink and counter space. On the aft end of the upper deck is a nick Jackson Crane and a custom stainless steel dingy cradle. 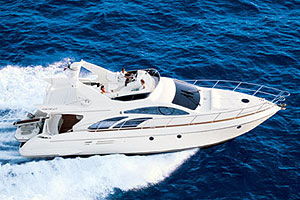 Please contact me for further information or an appointment to see this well designed yacht. The Peggy B's hull is solid hand laid fiberglass with Balteck coring starting 6 inches above the waterline. The hull is painted dark blue Awlgrip with a white boot stripe. The decks are also hand laid fiberglass with Balteck core. There is a 2" mid hull rub rail with stainless steel striker. For added comfort from the elements the deck and hull are fully insulated and all windows are "Diamond Sea Glaze". NEW 2016 Halo Pulse Compression Radar, Open Array. Stereo (Alpine) 9813 AM/FM/XM/CD x (3) Units (Owners Stateroom, Wheelhouse & Salon). Grey Water Holding 150 gal. Generator (Northern Lights) 97 Hrs.